Go! Stock! Go! employs a cartoon-like “Dr. Seuss” style as it becomes the first truly user friendly book on stock and finance. 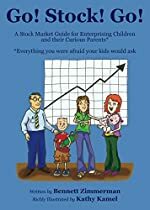 A storybook follows the Johnson family as they learn the fundamentals of stocks and bonds, the mechanics of investing, and important lessons on risk and reward. The humorous illustrated story is simple enough for children and teenagers yet is also directed towards adults and kids of all ages. The book offers an advanced section “Let’s Talk Stock” that provides an added level of knowledge for older readers. While designed with children in mind, this book is sure to become an adult favorite.